NOTES: 1971 date on instructions, but I'll bet it is older than that. 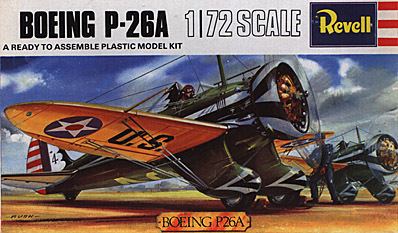 The P-26 was the USAAC's first really first rate monoplane fighter. Developed in the late 1920s, when it entered squadron service in the early 1930s, it was pretty much a world class fighter. So much that Boeing got a pretty good order for the aircraft (at least good for the times). It replaced biplane fighters and while it still had some biplane features (lots of rigging and fixed main landing gear), it was fast, relatively maneuverable and much liked by its pilots. The aircraft was still around at the time of Pearl Harbor with the Philippine Air Force flying them in the early days of the war. The type soldiered on until 1950 with the Guatemalan Air Force. There is a lone flying subject that came from Guatemala while another is with the Smithsonian collection at the NASM. A replica is in the USAF Museum in bogus markings while another replica is being built at the San Diego Aerospace Museum (thanks to Mark of Starfighter Decals for setting me straight on this). Forty years is a long time, yet it was that long ago, and probably longer, that this kit was developed. 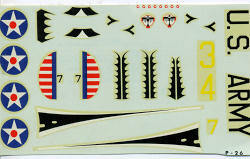 The kit has been reissued many times with the most sought the one in the three-pack that was sold a very long time ago. It has raised panel lines and rivet detail (rivets being the test of accuracy back then). A well molded engine, a somewhat misshapen engine cowling and a pilot figure to fill the empty cockpit. Wheels are trapped between spat halves so they can roll and Revell even drilled the holes for the rigging. The modeler of the day was expected to rob his mother's sewing kit for the appropriate thread. Actually, this is something nice to have as it saves even the modern modeler from drilling placement holes for the stretched sprue or wire or fishing line that is so much more in vogue today. Instructions are as basic as the kit with three construction steps. Much to my delight, the color referenc es are given in FS 595 shades. This one is olive drab with yellow wings and the off register decal sheet contains the markings for the 34th PS as was carried on the USAF Museum's plane. It has since been repainted with other markings. This particular kit was bought in a bag where the previous owner had cut all the parts from the sprues and tossed them in a Baggie. He even trimmed the decal sheet and I'm surprised he didn't trim the instruction sheet as well. People who do this should be severely chastised. The decal sheet is past usefulness, however, thanks to the fine folks at Starfighter Decals, we not only have a number of optional decal sheets, but an excellent resin interior set to use on this beastie. 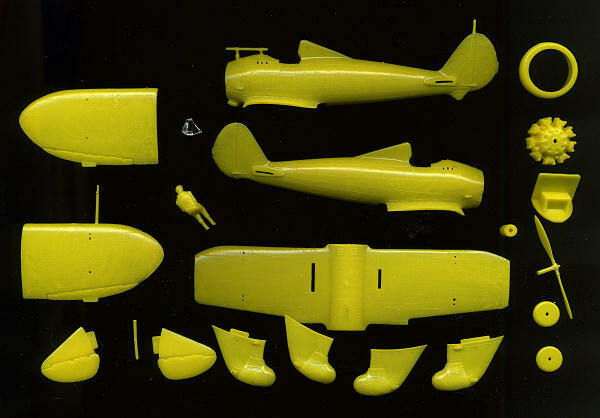 This kit is not all that difficult to find and while the somewhat rare Pavla kit is more accurate, this one can be built into a very nice replica with a bit of work. Thanks to me and my keen business acumen for this one. Thanks to the Internet for allowing me to find a scan of the box top.